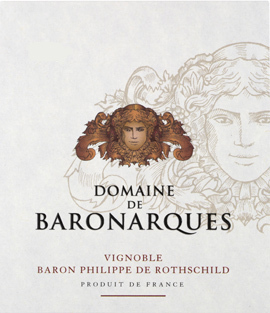 The Domaine de Baronarques premium red wine is a blend of Bordeaux varieties (Merlot, Cabernet Franc, Cabernet Sauvignon) and Mediterranean varieties (Syrah, Malbec, Grenache) in a proportion which varies according to the vintage. The complex, Merlot-dominated blend gives the wine its richness, its refined aromas and flavours and its elegance. 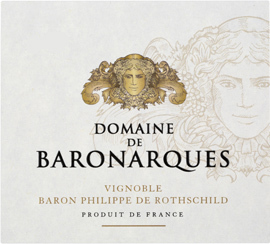 Domaine de Baronarques is a wine with ageing potential, but the combination of its terroir, the grape varieties used and Baron Philippe de Rothschild’s winemaking skills mean that it can be enjoyed on the fruit when young. Produced in limited quantities since the 2008 vintage, this second wine is a blend of Mediterranean varieties (Syrah, Grenache, Malbec) and Bordeaux varieties (Merlot, Cabernet Franc, Cabernet Sauvignon) in proportions which vary according to the vintage. Generous fruit, touches of spice and perfectly integrated oak give the wine complexity and rich flavour. 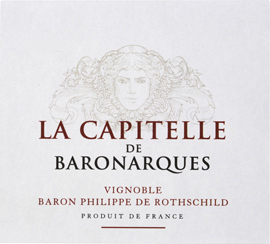 The name Capitelle is a reference to the dry-stone huts built by the region’s winegrowers in the 19th century. Since the 2009 vintage, Domaine de Baronarques has produced a fine AOC Limoux white wine. Made entirely from the Chardonnay grape, the wine reveals all the richness of the Limoux terroir, long appreciated by wine lovers all over the world. Its complex aromas and flavours, minerality, freshness and balance make it a wine with ageing potential that can rival the finest appellations.